This report has the ring of authenticity to it and it also conforms to the most plausible scenario. Thus we have two points created by actual eyeballs. This plane took a westerly heading after a major battery fire broke out in the cargo hold and overwhelmed the crew and the passengers. In the four minutes or so left to the crew to live, one of them took the plane up to extreme height to plausibly blow out a window to possibly clear the cockpit of smoke, then put the plane into a dive to take it down to 10,000 feet where it might be possible for passengers to survive. At the same time he turned the plane west toward possible landing fields. Not knowing the source of this obviously serious fire, they did pull the breakers in the event it was an electrical fire. The plane then crashed into the Arabian Sea between the Maldives and the African coast. The pilot was cut off by the co pilot likely move to pull the breakers and then likely leaving the cockpit to discover the problem before been overwhelmed. His actions were a desperate maneuver to kill the fire itself and again to possibly blow out a window. Of course, they did not have a chance. 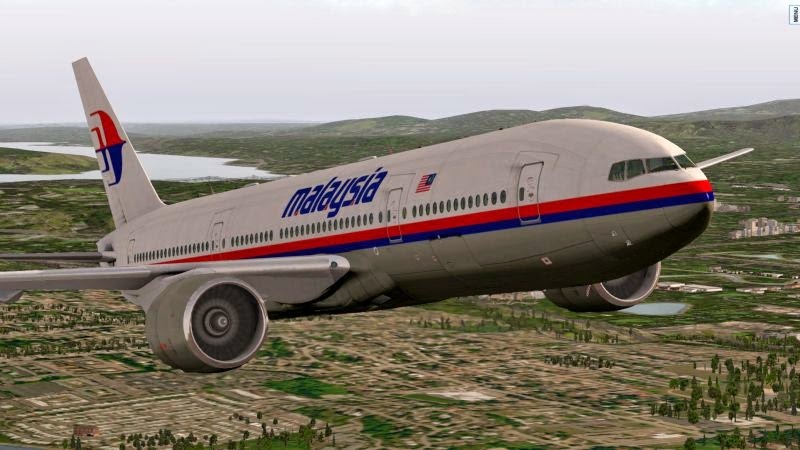 A British woman claims she may have seen the missing Malaysia Airlines flight MH370 on fire during a sailing holiday back in March. Katherine Tee was traveling across the Indian Ocean with husband Marc Horn when she saw what she believed was a plane on fire crossing the night sky, trailing a plume of black smoke behind it. She told the Phuket Gazette: “I was on night watch. My husband was asleep below deck and our one other crew member was asleep on deck. “I saw something that looked like a plane on fire. That’s what I thought it was. Then, I thought I must be mad… It caught my attention because I had never seen a plane with orange lights before, so I wondered what they were. Tee and Horn were sailing from Cochin, India to Phuket on board a 40-foot sloop. The couple later discovered their vessel was in the vicinity of one of the projected flight paths for MH370 and have filed a report with the Joint Agency Coordination Centre – an Australian organisation tasked with coordinating the search in the southern Indian Ocean. Flight MH370, bound for Beijing from Kuala Lumpur, disappeared on 8 March with 239 people on board. Back in March, Maldives islanders also reported seeing a "low flying jumbo jet" on 8 March at 6.15am. Tee’s account of what she saw comes amid speculation the plane may not have crashed into the southern Indian Ocean at all. Although pings matching the frequency of those from a black box recorder were identified by search crews, no debris has been found from the plane. On Wednesday it was announced scientists in Hong Kong are planning to release detailed information about a mysterious noise – possibly that of an ocean impact – recorded by two undersea receivers in the Indian Ocean about the time the flight ceased satellite transmissions and vanished. The low-frequency noise, which was outside the normal range of hearing and had to be sped up to be made audible, appears to have traveled halfway across the Indian Ocean to the receivers off the coast of Australia, the New York Times reports. “If you ask me what’s the probability this is related to the flight, without the satellite data it’s 25 or 30 percent, but that’s certainly worth taking a very close look at,” Dr Duncan added.